Das Bergdorf Galilea liegt ca. 30 Autominuten von der Hauptstadt Palma de Mallorca entfernt. Es gehört zur Gemeinde Puigpunyent. Das pittoreske Dorf inmitten des Tramuntana Gebirges hat sein traditionelles Gesicht bewahrt. In der Mitte des Dorfes thront die Kirche, um die herum sich traditionelle Steinhäuser gruppieren. Die Landhäuser mit wunderschön angelegte Gärten schmiegen sich an den Hang und bieten eine faszinierende Weitsicht bis hin zur Bucht von Palma de Mallorca; besonders überwältigend ist diese Aussicht nachts, wenn die Halbinsel von Santa Ponsa beleuchtet ist. Dieser Charme des Örtchens macht Immobilien in Galilea sehr beliebt. Aber auch die Dörfer, Puigpunyent, Establiments und Esporles haben viel zu bieten. Fragen sie unsere Immobilenberater in Palma nach der passenden Immobilie in Galilea am Fuße der Tramuntana. Wegen der Höhenlage wird es im Sommer nicht zu heiß, außerdem weht an den meisten Tagen eine kühlende Brise vom Meer. Die Winter in Galilea sind mild, da das Dorf Südorientierung hat, so dass von morgens bis abends die Sonne auf dem Ort steht. Einer von vielen Gründen eine Immobilie in Galilea zu kaufen. Das Dorf ist auch ein idealer Ausgangspunkt für Wanderungen durch das Gebirge der Sierra de Tramuntana. Das Naturreservat „La Reserva“ sorgt für die Erhaltung der schönen Landschaft. Auch unter Radsportfreunden, die mit dem Rennrad oder Montain Bike das Tramuntanagebirge und andere Teile von Mallorca unter die Räder nehmen wollen, ist Galilea sehr beliebt. Ihr Immobilienmakler für Galilea findet für Sie das bereits liebevoll sanierte Steinhaus mit Garten und Pool oder eine Investitionsmöglichkeit mit Renovationsbedarf, um ihre ganz individuelle Immobilie in Galilea zu erschaffen. 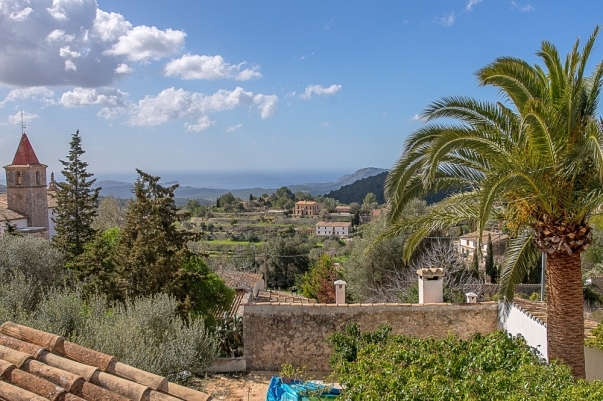 The mountain village Galilea is approximately a 30 minutes` drive away from the capital of Palma de Mallorca. Galilea belongs to the municipality of Puigpunyent. The picturesque village in the heart of the Tramuntana mountains has maintained its traditional character. In the centre of the village, the church sits enthroned with traditional stone houses grouped around it. The country homes with beautifully arranged gardens nestle up against the slope and offer amazing views up to the Bay of Palma de Mallorca. These views are especially magnificent at night, when the peninsula of Santa Ponsa is illuminated. The charm of this place makes real estate in Galilea very popular. But the villages Puigpunyent, Establiments and Esporles have a lot to offer as well. Ask your estate agent in Palma for the suitable property in Galilea, at the foot of the Tramuntana. Because of the altitude, it does not get too hot in summer, and most days, there is also a cooling breeze coming from the sea. The winters in Galilea are mild, because the village is oriented towards the South, so the sun shines on the place from the morning to the evening. One of many reasons to buy real estate in Galilea. The village is the perfect starting point for hikes in the mountains of the Sierra de Tramuntana. The nature reserve „La Reserva “ensures the conservation of the beautiful landscape. Galilea is also very popular among cycling enthusiasts, who want to explore the Tramuntana Mountains and other parts of Majorca by racing cycle or mountain bike. Your estate agent for Galilea will find the lovingly renovated stone house with garden and pool or the investment property in need for renovation, in order to design your unique property in Galilea.